When it comes to masks in the green beauty and luxury field, we’ve got it pretty good. 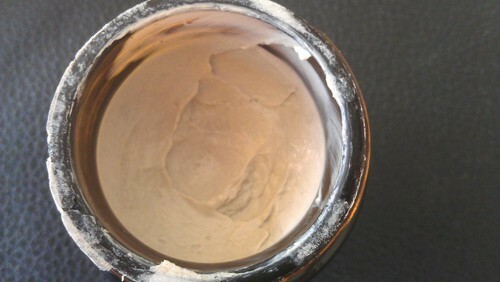 There are a lot of options: powders that turn to creams, gels, clays, etc. African Botanics Marula Mineral Cleansing Mask is the latter, a ready-to-go clay mask reminiscent of the tube of Origins Clear Improvement Mask most of us may remember from high school/college days. Think of this as a luxury upgrade to the clay masks from yesteryears, a antioxidant-rich, nourishing clay mask that features pretty green ingredients. I’ve been interested in the African Botanics line for a while and here’s why: they have pretty clean ingredients, they source many of their ingredients from South Africa (such as the Marula Oil) and they’re relatively under the radar yet have great presence at many of the upscale boutiques such as Space N.K., B-Glowing and CAP Beauty. Clay-based treatment mask that deeply cleanses and refreshes fatigued skin while providing hydration, vitamins, and energy to your skin. Replenishes skin with minerals rich in iron, zinc, magnesium and amino acids to boost circulation and stimulate cell renewal. The antioxidant and omega-rich fusion of Marula, Baobab and Africa’s legendary botanicals purify, clear congested pores, brighten, firm and smooth the skin. Enhanced with the latest plant stem cell technology, this mask deeply rejuvenates while addressing facial blemishes, breakouts, discoloration and oxidative stress. 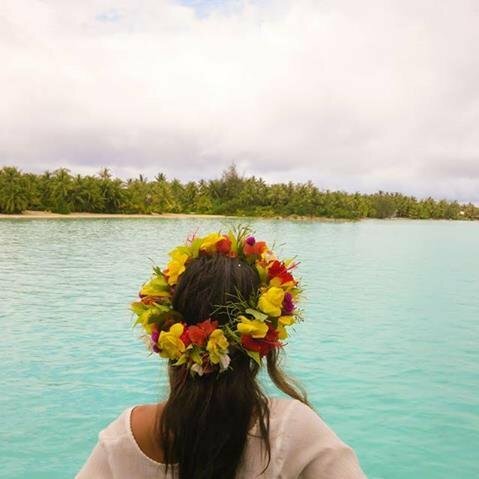 Resores a healthy glow without drying or leaving your skin feeling taut. What I like is that white clay which is purifying and drawing is balanced with rich plant oils from Marula, Baobab, Acocado which all are renowned as superb oils that keep skin plumped. There is also Alpine Rose Leaf cell culture extract which supposedly increases cell longevity, and lactic acid which exfoliates and plumps skin. Essentially this mask promises the purifying properties of a clay with the anti-aging properties of what they can ‘essential’ extracts or plant oils that balance out the drawing properties of clay allowing the mask to remain rather soft, applying as a paste and staying consistent throughout. Right off the bat, I loved the little, subtleties from the way the box opened to the mirrored cap on the frosted glass. It reminds me a lot of the Omorovicza Thermal Balm in terms of appearance. Once you open the jar, you’ll notice a natural scent of clays mixed with citrus which is a good balancing act. 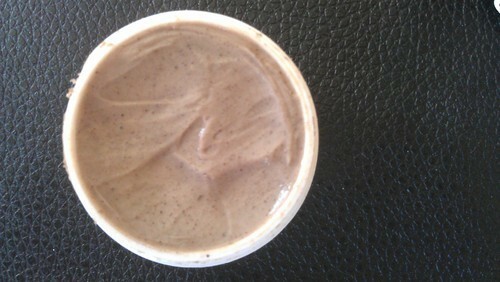 The texture of the clay mask is substantial yet also light enough to easily scoop. I’d compare it to a light, fluffy peanut butter. It also spreads pretty easily and evenly on skin which makes application a breeze. Due to the presence of oils, this mask will also not harden too much during application which is great for keeping moisture in your skin. I find that if I apply too much around my laugh lines, there is a tingle sensation that can feel a little unpleasant but that’s my own skin sensitivity that tends to happen with a significant number of products. I leave this mask on for the recommended 5-15 minutes (usually going for 15 minutes to get my money’s worth) and wash off as a cleanser which supposedly also helps to exfoliate skin. The wash off is quite simple and the mask removes fairly easily without the need for excess scrubbing. What I like about this mask is how easy and simple it is to use. No self-mixing (which is great for when you have time and want to fine tune, but sometimes you just want to get a quick mask session in- feelme?? ), soft texture so no tugging at skin for uneven application, and easy to rinse off. In terms of results, I felt that this was a very useful and convenient mask. Despite initial tingling which is normal for me, it’s actually very gentle overall especially for a clay based product which makes it good for those with sensitive skin. In full honesty, I’m not sure if this mask did anything to address the anti-aging claims such as increasing firmness or density, though I wouldn’t rely on this mask as the primary source of my anti-aging skincare needs anyway. With that said I did find the clays to be quite resourceful at tackling congestion in a non-irritating manner and thereby also taking care of my skin when stressed (which tends to manifest in excess oil production and slow turnover). Those with more problematic skin might want to apply a hearty layer and leave the mask on for longer than the recommended 15 minute allotment. At $75 for 1.7 fl oz, this is pricey especially as it is ready made which tends to run out quicker. This mask can be used 2-3 times per week and while I’ve only stuck to using it once per week, I would imagine increasing usage would make it run out easily within 2 months. The closest mask similar to this would be the Kahina Giving Beauty Antioxidant Mask which is also a ready-made clay mask that retails for $62 for the same amount of product. Because I enjoy these masks for their dual use: clays to draw out and oils to nourish principal, I always keep one stocked for when my skin needs something quick yet gentle. Have you tried anything from this line? Any good clay masks you keep in your top shelf? Leave a note in the comments section! I’ve been on an obsession with masks recently and I’ve noticed they seem to be divided among two camps of “purifying” masks and “nourishing” masks. My skin is at that stage where a mask that is solely purifying is not enough since I need that extra something to make it glow, and a mask that is purely nourishing is too rich for my blemish prone skin. So I started paying more attention to clay masks. Kahina’s Antioxidant Mask and Aesop’s Primrose Masque aren’t like the pore-vacuuming clay masks of yesteryear that left skin irritated and stripped. These masks infuse skin with nutrients like antioxidants, nourishing botanical oils, and minerals that give skin a wonderful glow while decongesting pores. Aesop’s Primrose Facial Cleansing Masque has an earthy, green scent that won’t offend most senses. The product is a hardened clay so you will need to use the heat from your fingers to liquefy it a little so it melts easily on the face. It uses Kaolin clay and Bentonite, which are very ancient traditional cosmetic ingredients used to draw out toxins and impurities. There is also Evening Primrose Oil, Rose Canina Fruit Oil, and Sage Oil which provide antioxidants, Vitamin E, and hydration. I found this masque a little messy to scoop since it is a little hard, which is why the sides of the bottle are a little messy. But applying on the face was a breeze. My skin didn’t really feel anything when I had it on, even when it dried, my face wasn’t stiff and stone-like. I love that upon drying, it turns to a white crust on top of the skin so it washes off very easily and cleanly. The only thing is it wasn’t as strong as the mask by Kahina in drawing out impurities and hydrating. Kahina’s Antioxidant Mask utilizes Rhassoul Clay, which is a mineral rich clay mined from the Atlas mountain region in Morocco. This type of clay is very rich in skin friendly minerals such as silica and magnesium. Kahina’s Antioxidant mask is richer in hydrating and nutrient dense ingredients such as Argan Oil, Sunflower seed oil, Acai Fruit Oil, Pomegranate seed Extract, and Rosemary Leaf Extract. I love that Argan Oil, which Kahina is known for, is included so high in the ingredients list because it balances out the drawing properties of the clay perfectly so your skin is being nourished as well. There are definitely more antioxidant rich ingredients in this formula which is important for repairing your skin. 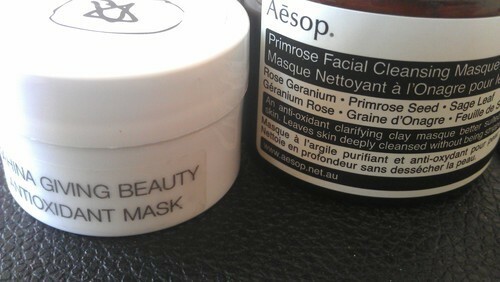 Upon using this sample, I noticed the mask is significantly lighter than the Aesop mask. The clay scoops very easily onto my finger and applies effortlessly onto my skin. Because it was so easy to apply, I really didn’t need a lot of it to cover my entire face. I noticed some granules in the formula which provide gentle exfoliation. The scent is interesting, it shares a definite clay scent with the Aesop product but this product has undertones of key botanical oils of Peppermint, Eucalyptus, and Geranium which is very refreshing. I felt a little bit of a tingling sensation along the pores next to my nose so I knew this product was more active than Aesops. Upon washing the mask, I found that it turned into almost a foamy cleanser. I was pretty surprised at that! I felt that despite being a stronger purifier, this also left my skin more nourished, most likely due to the more abundant number of skin repairing antioxidant actives. I was also surprised after washing off that my skin was a little flushed, not red in an irritated way, but a healthy glow showing that there was some circulation to my skin. I think both products are wonderful with the edge going to Kahina due to higher quality of ingredients, more abundant ingredients, and a more effective product that both purifies and nourishes. Ultimately both will provide great detoxification and carry good antioxidant nutrition, so you can’t go wrong!